The R13 is made of carefully selected, treated and stained African blackwood. 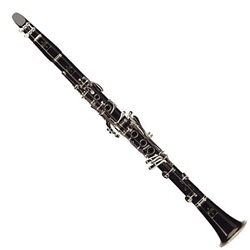 This, combined with Buffet-Crampon's unique 3 step polycylindrical bore, creates the dark, full sound that has become the standard of the industry. The rich, focused tone provides the performer with great versatility and power in all registers. The double fish skin, treated pads provide superior response and durability. The blue steel springs allow for fast and accurate key movement. It's no wonder that the R13 is consistently the choice of professionals throughout the world.